Dentures from our Orland Park, IL, practice can restore the form and function of your smile, even if you are missing most or all of your teeth. Kenneth W. Coffey, DDS, offers traditional restorations, crafted from the latest materials for a realistic look and comfortable fit. He also partners with a local oral surgeon to provide implant-supported dentures. These prosthetics offer unparalleled benefits such as increased stability and improved jawbone health. Dr. Coffey can conduct a complete consultation to help you choose the right type of dentures for your needs. He will consider your oral health, cosmetic goals, and budget to ensure your complete satisfaction and long-lasting results. Prior to recommending dentures, Dr. Coffey will need to address any current health conditions. 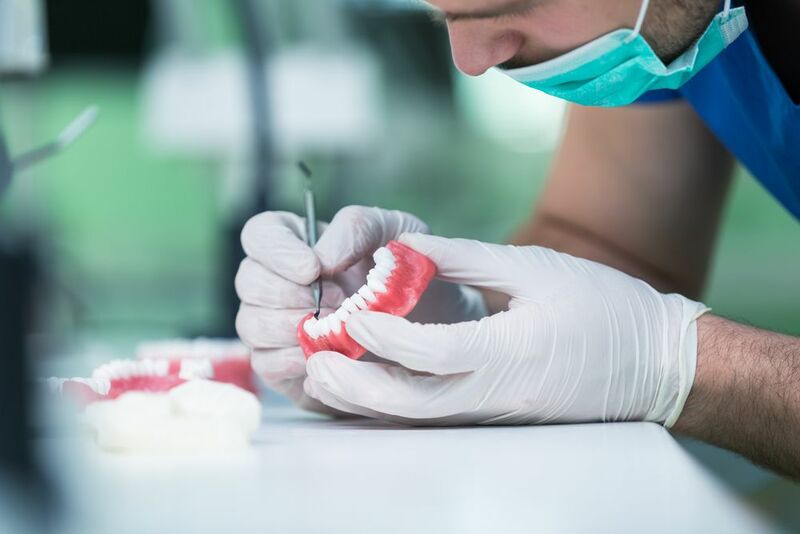 Gum disease will need to be treated and any necessary tooth extractions will need to be performed before you can be fitted for your prosthetic. Removable traditional dentures come in two different sizes. Partial dentures, as the name implies, are smaller because they are designed to replace only a part of your dental arch. Full dentures are intended to replace an entire dental arch. Both types are similarly made with a plastic base topped with synthetic teeth made from porcelain or another lifelike material. For full dentures, a combination of suction and adhesive helps to keep the denture in place. Partial dentures attach with tiny metal clasps that anchor the prosthetic to the nearby teeth. Dr. Coffey and his partner lab can carefully conceal these clips so that they are barely detectable. Traditional dentures are an affordable option, and they are almost always covered by insurance. They may also be appropriate if you have sustained jawbone recession, which will compromise your candidacy for dental implants. Dentures can restore the form and function of your smile, even if you are missing most or all of your teeth. Implant-supported dentures are an ultramodern option that closely mimics the look and feel of natural teeth. Like traditional dentures, they are also available as full and partial prosthetics. However, these restorations are not removable. Rather, they will attach to implant posts that will be permanently set in your jaw by an oral surgeon. After implant surgery, the posts will fuse with the bone tissue, effectively replacing your tooth roots. Depending on the number of teeth you need to replace, the All-on-4® system could be an effective treatment option for you. With this technique, your oral surgeon will set four implant posts in your jawbone at a slight angle, reducing the impact to your jaw. When we use the All-on-4 system, Dr.Coffey can often attach a secure, realistic restoration that same day. Once you have fully healed from dental implant surgery (approximately four to six months following surgery), he will remove this prosthetic and attach your permanent denture. Dental implants can help create a remarkably secure base so that your denture will never slip out of place. Accordingly, you could enjoy complete oral function, clear speech, and a natural-looking smile. Additionally, in most cases, you will not have any restrictions on your diet. An implant-supported denture can also enhance your long-term oral health. Functioning like your dental roots, the implant posts will emit signals to trigger tissue regeneration. Thus, implants can combat natural bone loss, which occurs quickly when you lose teeth. With an implant-supported denture, you can enjoy a strong, healthy jawbone for many years. Your facial proportions will remain unchanged, and you could also have a lower risk for additional tooth loss. You should be aware that insurance likely will not cover the full cost of implant-supported dentures. However, we believe that finances should not prevent you from enjoying the important benefits of dental implants. Therefore, we offer several payment options, including CareCredit®, and we can help you find a plan that works for you. To determine which type of denture would benefit you, contact Dr. Coffey’s office online or call (708) 403-7888 today to schedule a consultation. After a thorough evaluation of your oral health, Dr. Coffey can recommend a solution that can help restore your smile.